Guess We’ll Have to Save the World Ourselves | Small Farmers. Big Change. This is the second post from Tom Hanlon-Wilde sent to us from Quito, Ecuador where he is attending the Second Annual Meeting of the Small Farmer Symbol. Our bike-riding and bottle-recycling efforts are not nearly offsetting our jet-setting vacations and highway commuting, and the farmers in tropical and sub-tropical regions are paying the price. At the Fifth General Assembly of the Coordinating Body for Latin American and Caribbean Small-Scale Producers, three dozen leaders of co-operatives from throughout the hemisphere met in Quito, Ecuador, to review the coming climate changes and the changes farmers will have to take to ameliorate the destructive effects of the actions of their customers. Martha Yvette Aguilar reviewed the most current comparative scientific studies, concluding that the atmospheric concentrations of carbon dioxide are on pace to reach 440-570 ppm by 2020, the result of which will be an increase of 3.5 degree centigrade in the growing regions of the member co-operatives by 2050. Already, in the past 100 years, the average temperature in the coffee growing regions of southern Mexico and Guatemala and the Dominican Republic is up by 2 degrees C and in Nicaragua and El Salvador by 1 degree. The farmers of CONACADO in the Dominican Republic are seeing increases in defoliation and aborted flowering of their cacao trees due to the higher temperatures and more frequent droughts. The coffee farmer partners in Las Yungas of Bolivia will likely face the opposite threat – too much rain which promotes coffee rust and molds and leads to erosion. The effects will be varied within countries: farmers in coastal Peru (CEPICAFE) will likely see increased precipitation while farmers in Cusco and Puno will see droughts and resultant forest fires. The disappearance of glaciers from Ecuador, Colombia, Peru and Bolivia will drastically change the availability of water for household and agricultural use and is projected to directly cause deaths to remote populations. Ricardo Bustos of the Regional Indigenous Council of Cauca, Colombia, explained that 830 member farmers can utilize a different variety of coffee to maintain yields in the face of the rust and wilting of coffee due to climate change, but that the higher intensity crop is a disruption to the cultural practices that indigenous communities have developed in the growing of traditional foods, forcing members to chose between maintaining yields for their income and maintaining culture for their communities. 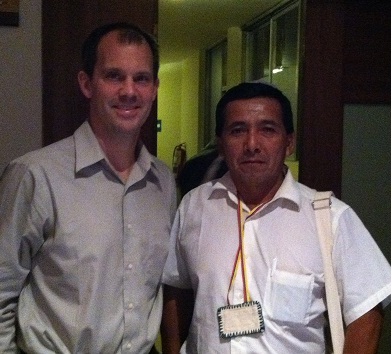 Carlos Ruiz Silva of APBOSMAM, a co-operative of 290 farmers in northern Peru, noted that their members are seeing more rapid maturing of bananas and shorter growing times for rice, which cause crop losses and require changes in farming techniques. Fewer cool nights (which is needed for the coffee plants) and more frequent high-intensity rains (which increase erosion and cause landslides and floods) have been observed. The threat of landslides due to high-intensity rains will require re-location and diversification of growing areas. The decline in yields of food crops for home (a 2 degree C increase in temperatures causes a 15% decline in corn yields in equatorial growing regions) will increase dependence on off-farm income and a change in the types of crops grown for home use. Growers are beginning to alter the spacing of coffee or cocoa trees and changing the spacing and types of trees inter-cropped with coffee or cocoa to deal with changes in temperature and precipitation. Evidence of climate change was right outside our window – the glacier on Cotopaxi Mountain is 40% smaller than it was in the mid-1970s. Hope for meaningful action by consumers filled the room, but more evident was the steely resolve to take matters into their own hands and ready member-farmers for the coming climate changes. I really appreciate you sharing the details of the effects of climate change across agricultural industries in such a tangible and specific way Tom, thanks!